In June of 1899, four newspaper reporters – Al Stevens, Jack Tournay, John Lewis, and Hal Wilshire from The Denver Post, Denver Republican, Denver Times, and the Rocky Mountain News – sat together at Denver Union Station, bored with the lack of action there. So, the sneaky reporters invented a story about how the Great Wall of China was scheduled to be demolished, and a road would be built using the stones from the ruins. Supposedly, American contractors were bidding on the project. One of the reporters was concerned about the ramifications of printing a false story, but the other men overrode him. When they left the Oxford Bar, they went to the Windsor Hotel, signed four false names to the register, and told the desk clerk to inform anyone who was interested that they had been meeting with a group of four men who later went to California. The imaginative reporters swore they would stick together on this story as long as the four were still living. The following day, all four newspapers ran the fictitious account on their front pages. The headline read “GREAT CHINESE WALL DOOMED! PEKING SEEKS WORLD TRADE!” At the time it was typical for Americans to anglicize foreign names – Peking was the American name for Beijing. The Denver papers discontinued the tale after a few days, but the story would not die. A couple of weeks after the Denver headlines, Lewis noted another US newspaper had published the story and included additional false information not reported in the first story. 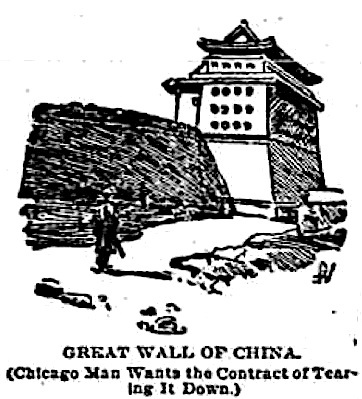 This newspaper had quotes from a Chinese bureaucrat confirming the story and had even included illustrations and comments about tearing down the wall. Ultimately, the story was printed in newspapers all over the United States and Europe. 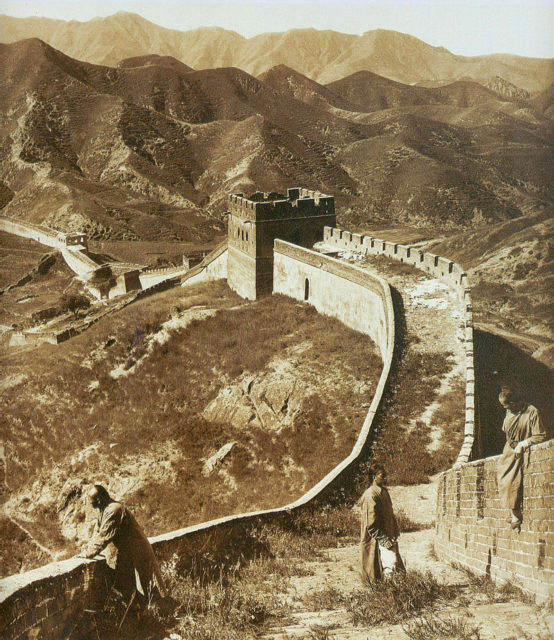 Different versions appeared, but the main idea persisted – the United States was sending contractors to dismantle the Great Wall of China. This was all happening during the late 19th-century rise of expansionism. In 1898, Great Britain acquired a 99-year lease for Chinese territories, enlarging the Hong Kong colony that was surrendered in 1841. England sent a Naval fleet into the Gulf of Chihli and intimidated the Chinese into leasing out Weihaiwei in Shandong Province, China. Germany captured the Jiaozhou Bay in a gulf located in Qingdao, China and used it as a military base. The French leased Guangzhouwan, a small region on the southern coast of China. 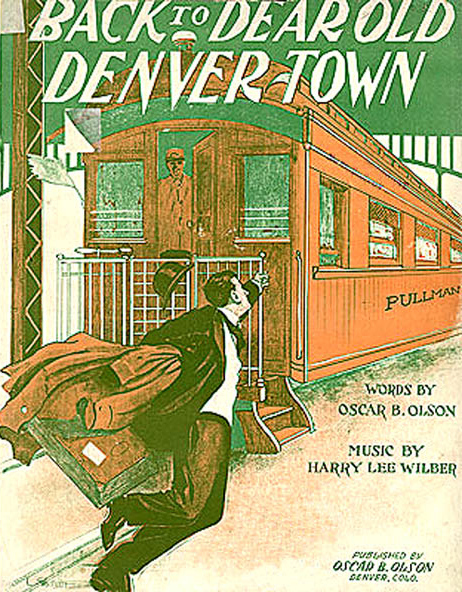 The 1899 hoax which began at the Denver train station was expanded in 1939 by Denver songwriter Harry Lee Wilber. In 1939, another fabricated legend was created when Denver songwriter Harry Lee Wilber claimed that the 1899 hoax had provoked the Boxer Rebellion of 1900. Paul Harvey, a famous radio personality, broadcast the story. There was never any correlation with the fake news story and the Boxer Rebellion. The Boxer Rebellion was an anti-foreigner, anti-Christian, nationalist uprising in early 1901 and had been brewing long before the hoax began. No evidence in the written history of China correlates the hoax with the Boxer Rebellion.After ten years, the last surviving reporter of the hoax, Hal Wilshire, confessed the secret.